Today we are pleased to announce our development roadmap for the remainder of 2019. The roadmap focuses on both adoption of the Stratis Platform and an increase in utilization of the Stratis Token. Introducing support of new programming languages inherently increases the audience that the Stratis Platform appeals to. The addition of this support will enable a new development community who are not familiar with the Microsoft .NET Core framework to interact with and develop on the Stratis ecosystem. The further development of the Breeze Privacy Protocol will include a new version of the Breeze Wallet with enhanced security. In addition, we are working on bringing Segregated Witness support to the Stratis network to enable native Privacy Protocol support. The introduction of further consensus algorithms for Stratis Sidechains will grant even more bespoke use-cases on the Stratis Platform. We envision the development of further consensus algorithms on Stratis Sidechains will negate the requirement for the forking of source code. This will drive collaboration and encourage development on the already established Stratis codebase. Stratis Sidechain Masternodes will enable holders of the Stratis Token to operate as a block producer on a Stratis Sidechain. The first Sidechain Masternodes will be on the Cirrus Sidechain network, these Masternodes will earn rewards from transactions fees and smart contracts executed on the network. Whilst we firmly believe there is still a market for Initial Coin Offerings (ICO), Stratis will extend the functionality of the Stratis ICO Platform to cater for the regulatory requirements needed to conduct a Security Token Offering (STO). The support for STO’s will also bring additional features to the ICO Platform, with the inclusion of the platform being Smart Contract aware. This will allow token issuance contracts to be utilized during a crowdfund. The release of Stratis Core 2.0 will incorporate new features that will enable interaction with other components within the Stratis ecosystem. The focus of this update is to continue to provide a simple user-experience from within the GUI, allowing users to manage their tokens and deploy new smart contracts with ease. A mobile application that caters for the sending and receiving of the Stratis Token will be delivered for both Android and iOS. This mobile wallet will allow users to simply transact on their mobile device utilizing a secure, functional and elegant mobile application. Stratis will develop a Payment Gateway that can be deployed by third-parties to utilize the STRAT token as a form of payment. The payment gateway will be designed to allow other tokens launching on the Stratis Platform to seamlessly implement the Stratis Payment Gateway for their requirements. Unity is the creator of the world’s most widely used real-time 3D development platform. Stratis will provide an SDK for Unity developers, enabling the utilization of the Blockchain during game development. This unleashes a wide range of functionality for in-game token and asset markets where the blockchain is a perfectly suited technology. 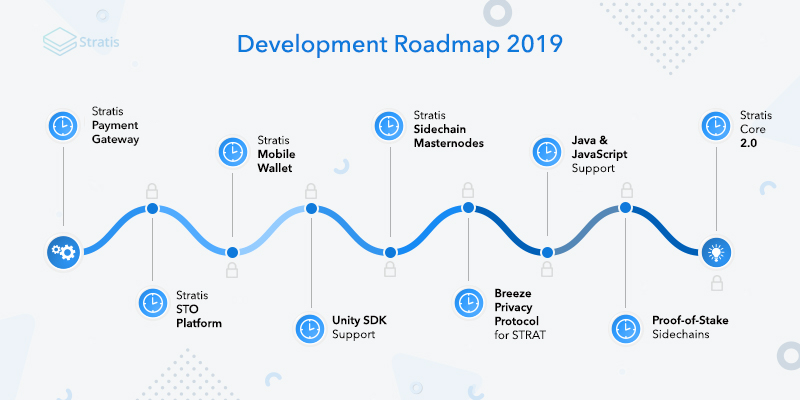 The above development activities represent the core work that will take place at Stratis over the remaining course of this year. There are additional internal developments that we aim to deliver within the coming months, which will be detailed in due course.